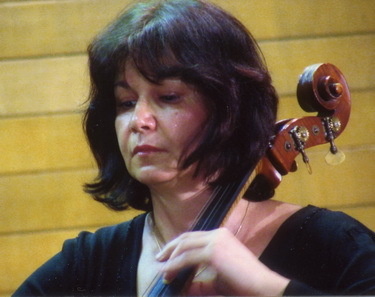 Born on the 1st of February 1955, in Bucharest, Anca Vartolomei studied at the Conservatoire (presently the National University of Music) in Bucharest, under Aurel Niculescu (cello) and Nicolae Brandus (chamber music).She improved her skills at the International Seminaries in Weimar (studying under Galina Kossolupova) and in Budapest (under Vilmos Tatray). Afterwards, she was also invited to teach at the International Summer Courses in Darmstadt (she was already a cello teacher at the “George Enescu” High School in Bucharest). Winner of the Brasov Interpretation Contest (1976) and of four editions of the National Festival (1983, 1985, 1987 and 1989), she was awarded several Music Critics Prizes (awarded by the Association of Theater and Music): in 1982, as a member of the Musica Nova ensemble, in 1986, as a soloist and in 1987 as a member of the Archaeus ensemble. As part of this last ensemble, she also received the Prize of the Romanian Union of Composers and Musicologists (1990), the Prize of the Romanian Music Critics (1991), the "Actualitatea Muzicala" magazine Prize (1996) and the SOROS FoundationPrize (1997). Cellist Anca Vartolomei performed in concerts and recitals in Bucharest and the main cities in Romania, but also in Germany, France, Italy, Spain, Switzerland, the United States of America etc. Her repertory is mainly based on contemporary music, many of the most important Romanian composers having dedicated their works to her. The majority of her interpretative creations are now part of the fonoteca Radiodifuziunii Romane (either recorded in concert or specially recorded) and some of them can also be found on discs recorded by the Electrecord House (Bucharest), Attaca Records (Amsterdam) or EMEC (Madrid).